Each new project comes with different challenges and opportunities. However some have particularly good outcomes where everybody seems to benefit. 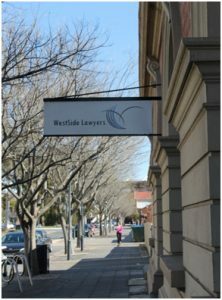 It was a pleasure being associated with the change of use and renovation of the Old Hindmarsh Post Office for use as legal offices. The “not for profit” community based legal practice wished to relocate from The Parks at Angle Park to Hindmarsh. The site they chose to relocate to was the former Hindmarsh Post Office on Port Road a State Heritage Item (SA Heritage Register No. 10558). The existing building is an attractive two storey red brick building with extensive plaster corbels, quoins and parapets. After operating as a Post Office for many years work had been undertaken to the building in a haphazard way. Much of the original fabric of the building had been removed or damaged.Lots of walls, partitions had been added to make the building functional for Australia Post but with little regard for the importance of the heritage listed building. Much of this non original fabric has been removed from the interior of the building which has been restored. The exterior of the building has been painted and new signage erected. The land use is suitablefor the building and ideally locality in Hindmarsh ensuring a State Heritage Item is restored, used and maintained.